Well, first of all, I would like to apologize for the delay publishing this PROST and for not telling you about my experiences in Venezuela. On April 26th, 2017 I returned to Germany and the last 4 months in my Country were simply fascinating. I’ve had the privilege of visiting several microbreweries and also I had the opportunity to spend a lot of time with my family and friends. The first microbrewery I visited was Norte del Sur. I contacted them last year as soon as I knew I had to go back to Venezuela. But the best of all was that they immediately answered me: “Yes Emily, come. We’ll be waiting for you” – something I really loved because sometimes it’s not that easy – so I thank them so much. Before I’ll begin to tell you about this visit, I would like to explain a little bit about the current situation of the Venezuelan craft beer movement. I believe- and I hope not to offend anyone – the movement is just about to start but it is definitely on the right way. It can not be compared with countries like Germany or United States in which you can find a brewery in every corner with huge tanks and more than 1000 types of beers but I believe that if we continue in this way we can take the craft beer movement to another level in the near future, for sure. Alexander, Iliana and Gabriel Albahaca are the owners of Norte del Sur brewery. The name, Norte del Sur is due to the fact that Venezuela is located in the north of South America. They started the business 5 years ago at home, with a production of 20 liters per month and they used to use all of their kitchen’s equipment. Alexander considers himself as a self-taught person and he reads about the brewing process every single day. Recently, they attended the Craft Brewer Conference 2017 held in the USA. Alexander designed his own craft filling machine. The brewery is located in El Hatillo. 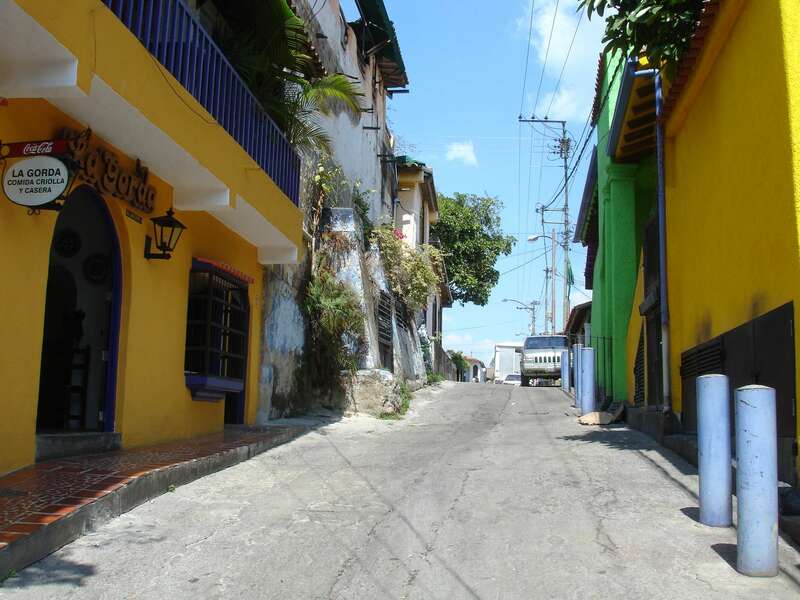 It’s a tourist town near to Caracas City- the capital of Venezuela-. El Hatillo is a very nice place and it is surrounded by restaurants, discos and now by craft breweries like Norte del Sur. Currently, they have a production of 80 lt per week and they are investing to produce 2000 lt. They designed their own tanks together with a Chinese Company. All of their raw materials are imported, they are using malts from Weyermann, some hops from Hallertau and from Yakima Valley in USA. The bottles are from a Venezuelan supplier – Venvidrio -. And also they belong to the Venezuelan Craft Brewers Association. They’re dreaming about to create a beer street and turning El Hatillo into a meeting place just for craft beers. On January 5th, 2017 we were able to brew a beer. We brewed an American Pale Ale – Sadly, I came a little bit late but we enjoyed part of the day doing what we like the most. The beer we made had an alcohol percentage of 5.5%. The name is 1811- year in which the independence of Venezuela was declared-. It is a light beer, refreshing, with a medium body, it uses American hops that are added in the boiling step and in the Whirlpool step. Also, I was able to taste a Christmas beer that they made the last year and I really loved it. Thanks, guys. I wish you lot of success in all of your projects. In this PROST I would like to leave you a video that I really love. The song is called „ Venezuela”. I want to share it with you because we are living a really difficult situation nowadays and this video is full of hope. 95% of the contamination with microorganisms such as Lactobacillus enters through the O2. In general, if there is a presence of Lactobacillus it indicates that the CIP is failing (cleaning) and if there is a presence of fungi it indicates that the disinfection has failed. Previous PostTurn your passion into a life project. Next Post"Brewing is our greatest act of rebellion." My days in VENEZUELA.